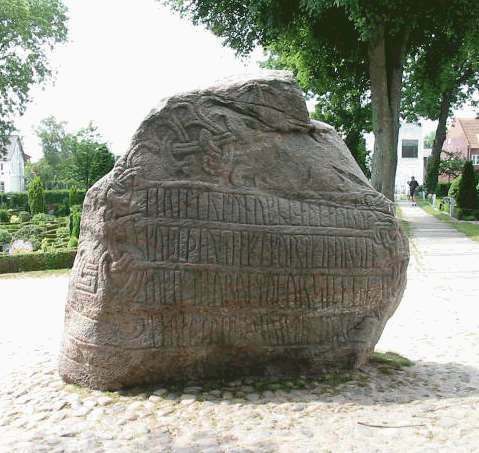 On the small runic stone we find the oldest words from a Danish king and for the first time in Denmark the name of the country is mentioned. Nevertheless the name had been used for at least 75 years in Europe. 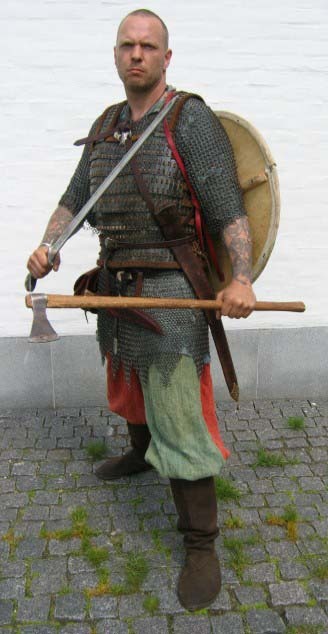 King Alfred the Great – King of Wessex (871-899) and very much interested in culture – wrote a geographical description of Northern Europe and used the word “dene mearc” about the Danish area. Regino’s Chronicle, which was written around the year 900 in the convent of Prum near Cologne, also mentioned “Denimarca,” so the name was already known when Gorm used it. King Gorm died in 958/59. If the human remains found under Jelling Church belong to him, he must have been between 35 and 50 years of age at his death. His son Harold took over just before 960, so Gorm must have been born between 908 and 923. He made the stone in memory of his wife, who died before him. We do not know when. 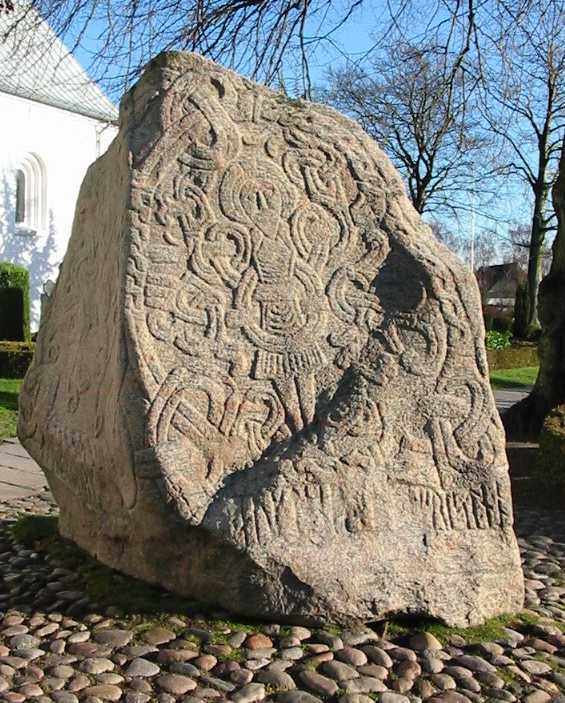 The stone was erected between 940 and 958 and we know that Gorm was announced king at the beginning of the 940s. The words “King Gorm” almost form a headline as the runes here are bigger than the rest. The word “kumler” is the plural and means “memories,” so there must have been more than one runic stone. 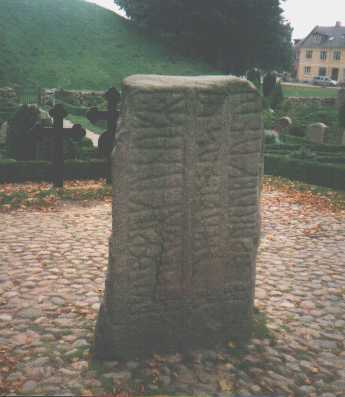 Thyra was probably buried in a stone circle with the runic stone as a tombstone. Today we have very little hope of finding her burial place. If it was placed centrally, it must be inside the present church yard. Here, however, many new graves have destroyed all traces. 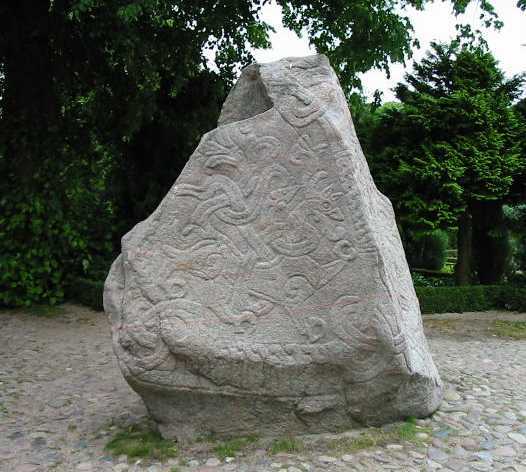 Speculations as to the original place of the small runic stone are many. On one of the barrows, at the head of the stone circle, or maybe near the present place? 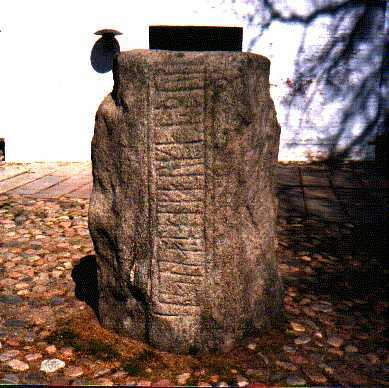 We know that in 1627 the stone was being used as a bench at the entrance of the church, and it was put up in its present place no later than in 1639.
of the stone is carried out by two persons; the decorations first and secondly the runes and it took about a whole year to carry out the entire job. Some of the peeling on the stone is perhaps caused by the three hot fires due to the burning of the wooden churches. Here you see a man in a coat with his arms wide open and a glory like the holy cross around his head; the crucified Christ without a cross. The two pictures are surrounded by connecting ropes and strings indicating that the pictures should be seen as a whole. The large stone is left almost in the original position. In 1981 however the stone needed straightening up and some digging was carried out below the stone. It turned out that the stone was situated partly on top of some old graves which indicates that the stone has been moved about one meter to the west. This probably happened when "Caspar Markedaner" in 1586 had the stone dug up. Perhaps even then the stone was leaning and at the same time it was partly covered in soil. Excavations in 1981 along the southern wall of the church showed that the surface of the churchyard had risen one meter since the church was built, so perhaps the words of Caspar Markedaner "digging up" suddenly makes sense. He actually raised the stone and by doing this he might have moved it just a little bit. The stone is 2.43 m high and weighs 10 tons.